Keiren Westwood: As the only Irish goalkeeper playing regularly in the Premier League, Westwood easily makes the team. However, he is still one of the worst performing keepers so far this campaign with just 14 points. Seamus Coleman: Coleman is obviously having an excellent season with Everton and this is reflected points-wise, as he is the eighth highest-scoring defender in total. Ciaran Clark: While Clark hasn’t always been picked by Villa, he has still managed to acquire a respectable number of Fantasy points — 26. Marc Wilson: Another decent performer with 23 points, Wilson has often played in midfield for Stoke and most recently, Ireland. Nevertheless, Fantasy Football lists him as a defender, hence we’ve no other option than to play him there. Joey O’Brien: Matching Wilson on 23 points is the West Ham man. Though somewhat worryingly for Fantasy players who have him in their team, he only made the bench for the club’s recent 3-0 win against Spurs. Robbie Brady: The Irishman is injured at the moment, but would easily make it into any hypothetical team. Indeed, he is the third highest-scoring midfielder in the league in total (and the highest-scoring Irish player) with an impressive 40 points. Anthony Pilkington: The winger hasn’t always been picked by Norwich, yet has still managed to sporadically make an impact, as his 17 points illustrate. Jon Walters: Another who could be regarded as a striker, but is listed as a midfielder. It’s been a far from vintage season so far for Walters and Stoke in general. Glenn Whelan: Whelan has been left out of the Stoke side more often than not, but the paucity of high-performing Irish central midfielders means he needs to be included despite only acquiring seven points. Stephen Quinn: Another who has suffered from a lack of game time, but he must be included due to a shortage of alternatives. Shane Long: Again, Ireland aren’t exactly blessed with options in this department, so Long makes it in despite having a sub-par season. Bench: Stephen Henderson, Damien Delaney, James McCarthy, Stephen Ireland. *We realise it’s not technically possible to pick one striker, but we’re ignoring this due to Ireland’s lack of strikers playing in the Premier League. Email “Here's what the Ireland team would be tomorrow night were it based on Fantasy Football points*”. 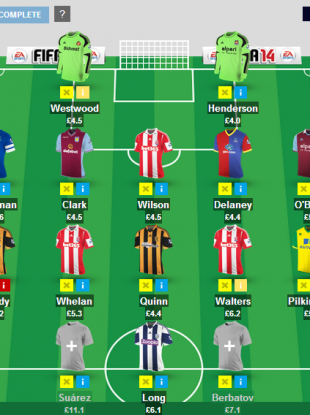 Feedback on “Here's what the Ireland team would be tomorrow night were it based on Fantasy Football points*”.